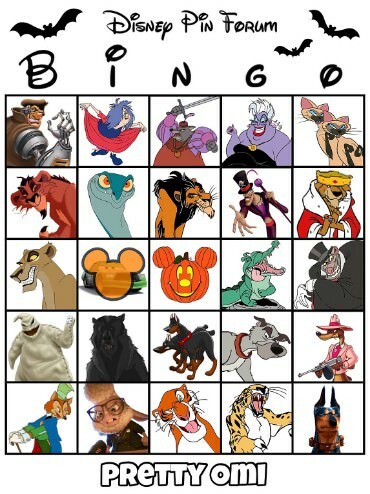 So I’m a big fan of Bingo (yes, I'm an old lady at heart), and have been toying with this idea for months now. I’ve been so busy/stressed that I’ve never actually brought the game to life - in fact, due to this busyness/stress, I’ve had to pretty much take a break from pins (and even sold off some of my traders.) This means my participation on DPF is basically limited to stalking threads and living vicariously through all of your pin activity. However, DPF is such a “happy place” for me; you guys can always cheer me up after a bad day. I still really want to stay active in some capacity, even if not through pins. 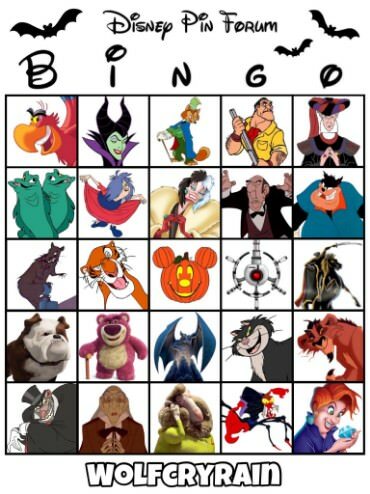 So I figure that running this game can be a way for me to continue being involved on the forum, and since it’s pretty easy to manage/play (I mean, it’s Bingo y'all), it won’t be too much extra on my plate, and will serve as a fun distraction rather than a chore. 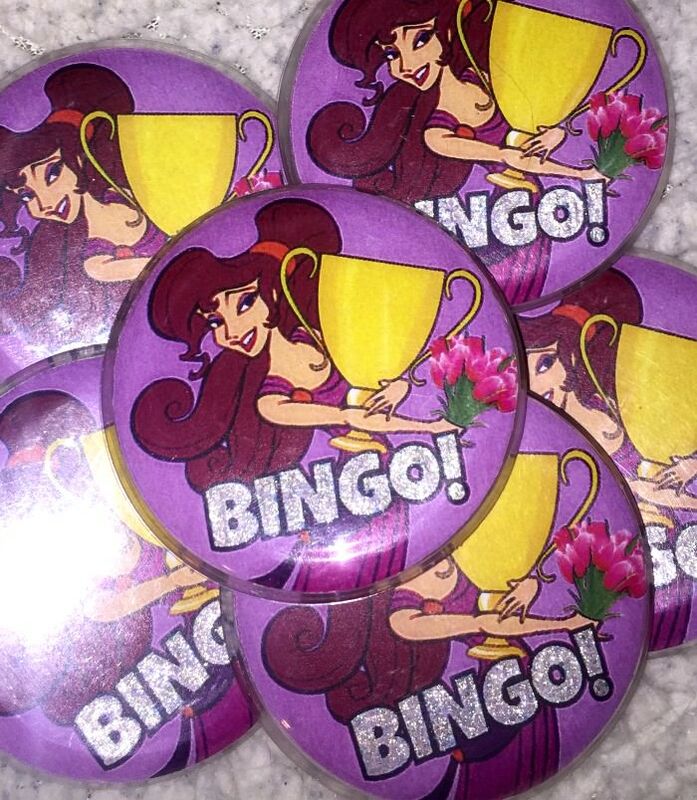 If you don’t know how Bingo works, then first of all, congratulations on freeing yourself from that rock you’ve been stuck under! I’m surprised you were able to receive pin mail down there. 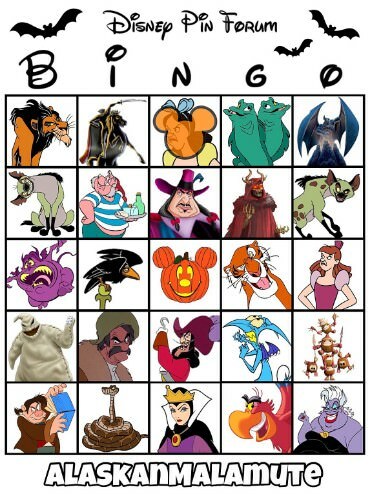 Bingo is a simple game that requires no skill and little effort, yet somehow still manages to be fun. The person running the game randomly draws letter/number combinations, usually from a spinny thingy that whirls little scraps of paper around (I believe the technical term is "spinny whirly thingy.") Each combination is called out, and if a player has that combo on their card, they mark the box with a plastic chip or stampy thingy (the technical term is “stampy thingy.”) So for instance, if "B14" was called, the person with the card above would mark that box in the upper left corner. 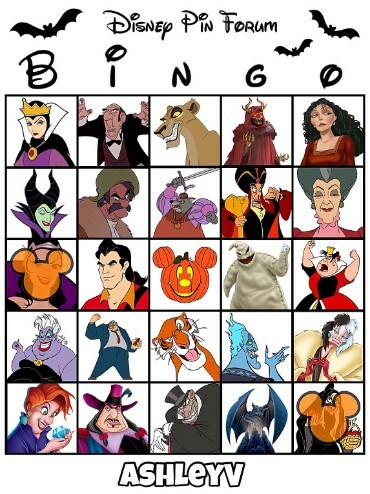 The first player to get a row of 5 (either horizontally, vertically, or diagonally), gets a BINGO and wins!!! Obviously, YOUR card must have a different character in each box, but this is just my example, so what did you expect? The best part is that *you* get to choose the characters on your card! There’s no system involving letters or numbers; if I simply call one of your characters, their box will get marked with a Mickey Head. 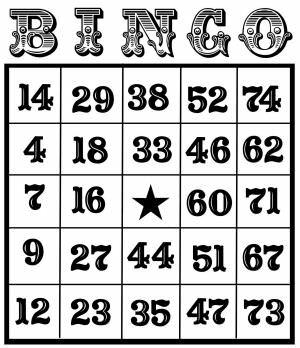 If you’re the first player to snag 5 in a row, you get to yell out “BINGO!” in a comment and rub it in everyone’s face. 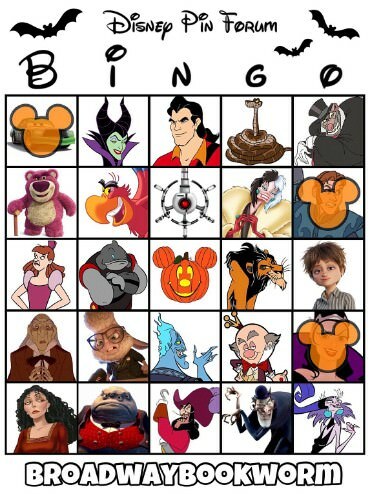 Since there are tons of characters in the Disney canon, hopefully we’ll be able to play a bunch of rounds! 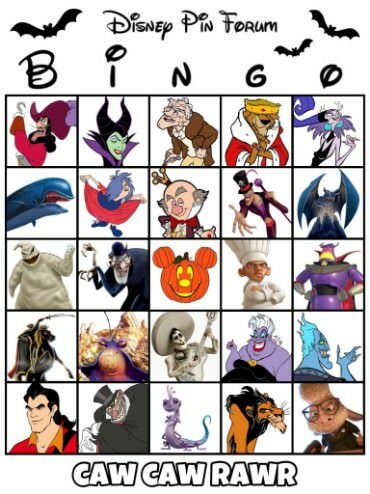 Round #3 (BINGOWEEN) starts on page 33! First, please read all of the rules below before signing up! Sign-up dates for new rounds will be posted in advance. After sign-ups have opened, simply comment here to claim a spot; if there are any available, I’ll add you to the list of Current Players below. If all spots have been taken, or if a round is already in progress, you'll be added to the Wait List. Those on the Wait List will be given priority access to sign up for the next round. I will PM you once you’ve officially been added to the game. 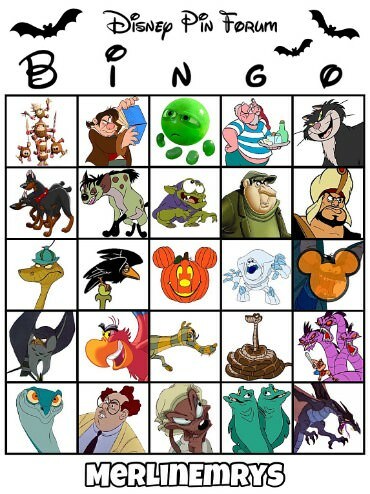 Please reply with the names of the 24 characters you would like on your Bingo card. You must submit your list before the deadline stated in my PM, or I will not be able to make your card in time. Do NOT post your list here!!! The day before the next round is scheduled to begin, all of the cards will be revealed here, in the post below the Current Players list. Your card will have your username at the bottom. You can't change your characters, but please check your card to make sure it matches your PM. Let the game begin!!! 5 new characters will be randomly drawn every day and revealed here. 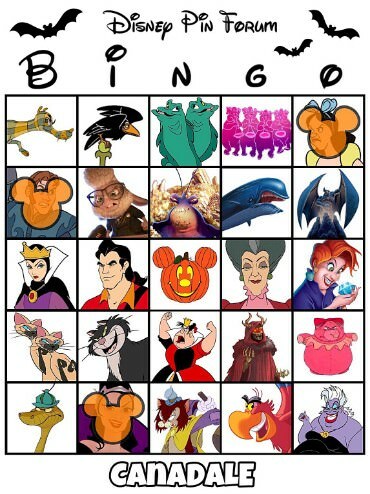 If any of these characters are on your card, you’ll see their box stamped with a Mickey Head! In order to keep the game moving, if I draw a character that is not on anyone’s card, I will skip over them and draw another, and so on until we get to a character that at least ONE player has selected. Keep track of the drawings and who’s currently in the lead by checking this thread daily. That’s pretty much all the effort required on your part! 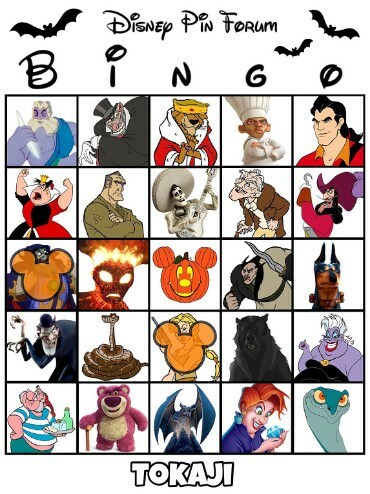 The first person to get a Bingo (5 Mickey Heads in a row, either horizontally, vertically, or diagonally), wins!!! You must select 24 different characters for each box on your card. No repeats. DO NOT POST YOUR LIST HERE OR SHARE IT! The cards must remain secret until just before the game begins. I will create your card with the characters placed in order of how you list them in your PM (top to bottom, left to right.) So if you care about having them placed in specific boxes, be sure to list them in that order. The character drawings will be COMPLETELY RANDOM, selected using an online number generator. 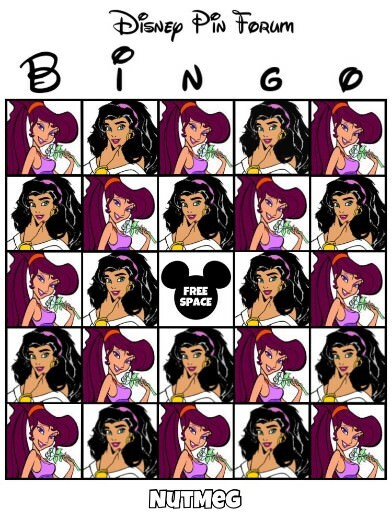 So even though I featured Meg and Esmeralda on my example card, I promise I won’t be playing favorites! You can only select characters from the movies listed in the post below. 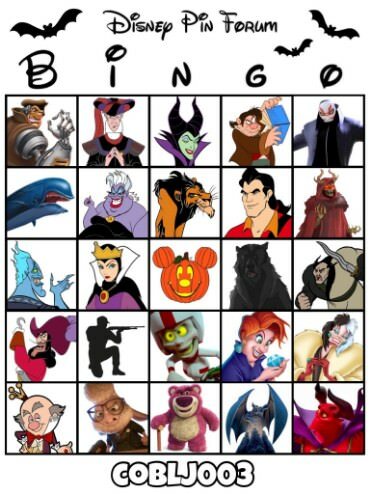 This list has been tailored with the goal of ensuring that all players have a fair shot at knowing the characters that are drawn, while still challenging players to be creative and exercise their Disney "trivia" muscles. Please read the notes above the movie list for more information on why some films have been included/excluded. There are over 500 CHARACTERS on my secret list of potential drawings!!! 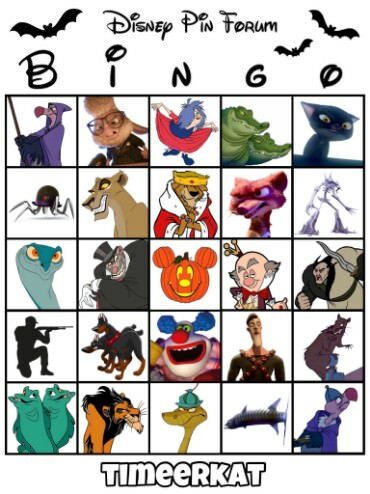 I wanted to make sure we had enough ammo to play as many rounds as possible, so this list includes everyone from heroes, villains, princesses, sidekicks, animals, humans, supernatural beings, anthropomorphic objects, major characters, minor characters, and everything in between! So I strongly encourage you to BE CREATIVE! Please be advised that the list includes different "versions" of some characters, but with stipulations that have been collectively decided upon via poll. Characters with more than one bodily form will be counted separately, but only when these forms have different names. 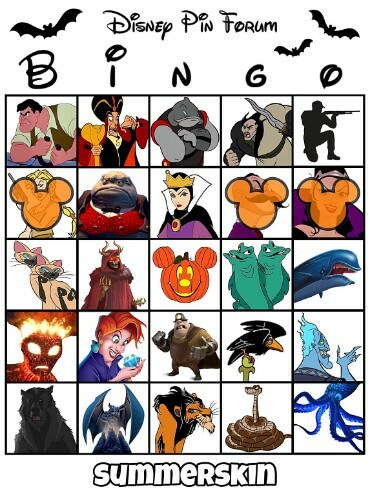 (eg: Ursula and Vanessa count as 2 characters; mermaid Ariel and human Ariel do not.) Characters who have alter-egos and/or disguises are subject to the same rule. (eg: Aladdin and Prince Ali count as 2 characters; Princess Jasmine and "street mouse" Jasmine do not.) Characters at different ages do NOT count separately. (eg: there is no difference between Dory and Baby Dory.) For a more detailed explanation of these particular rules, please read this post. When it comes to character "groups," the general rule is that characters are counted separately when they have individual names, and are grouped together when they do not. (eg: Ariel's sisters count as separate characters, as do the seven dwarfs; conversely, the unnamed Lost Boys count as one character.) This rule is subject to some exceptions at my discretion. (eg: Si & Am count as one character.) Please don't concern yourself too much with this issue - simply place the characters on your card as you see fit, and if this conflicts with how they are grouped/separated, I will PM you so you can adjust your list accordingly. Hopefully there are enough characters to last us for quite a while, but we may get to a certain point where we need to hit the reset button and start “recycling” them. But for now, once a character has been drawn, they’ll be removed from the game and won’t be included in future rounds. These characters will be marked in the Eliminated Characters list down below so you know which ones are not eligible to include on your card. However, you are absolutely allowed to re-use characters from your previous cards who have yet to be drawn. To keep things fair, you CANNOT change your characters once you’ve PM’ed them to me. So please think carefully and proofread before sending your list. The only exception will be if you've chosen a character(s) who fails to meet the above requirements, in which case I will let you know so that you may replace them. So please don't worry too much about the selection process! The most important thing is to HAVE FUN with it - I will monitor everyone's choices carefully and won't let anyone play with a "defective" card! 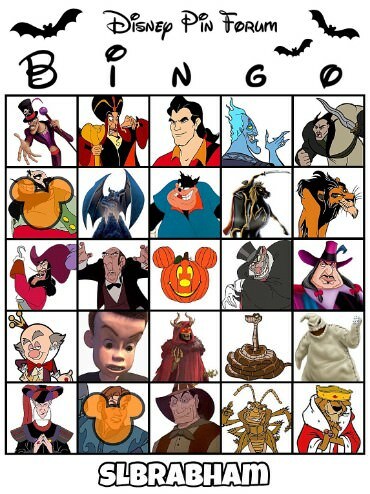 I know, that’s a lot of rules for a simple game of Bingo! These regulations are here to keep things fair and organized, and to address several specific questions/concerns that have been raised by players. But please don't get bogged down by all this information. Again, I will monitor the nitpicky stuff and make sure your card is good to go! And if you have any questions, please ask! 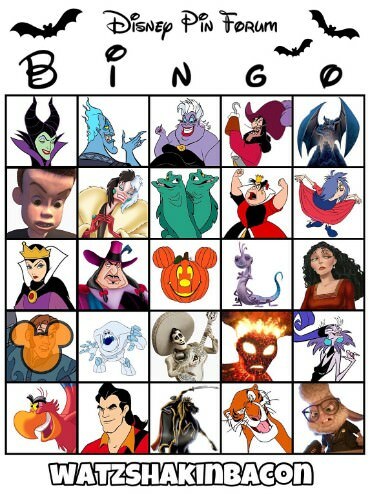 Please only choose characters from the films below. 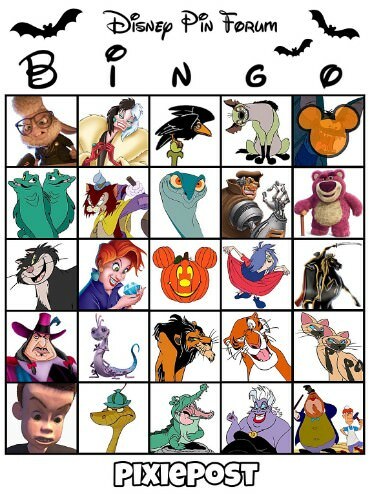 This list is limited to Disney’s animated features (no shorts or live-action, with the exception of Who Framed Roger Rabbit?, due to its popular animated characters), as well as only MAJOR theatrical releases. This is to ensure that all players have a fair shot at knowing the characters who are drawn. For this sake, I’ve cut some movies that technically fit the requirements, but have pretty much been lost to the sands of time; for instance, Home on the Range is excluded, because seriously, who can name a single character from that film? 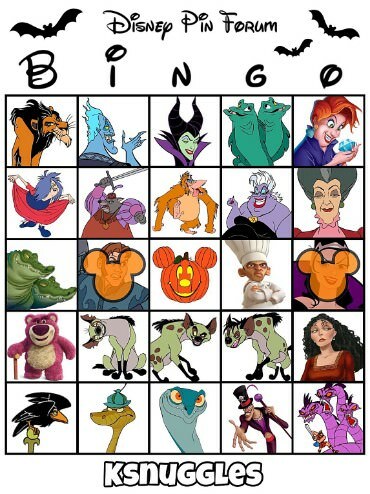 (If you can, I bow to your Disney expertise.) However, I did include some lesser-known films (such as Meet The Robinsons and DuckTales), because I know they have many fans on this forum, and because we don't want to make this TOO easy! Yet while there will probably (definitely) be some surprises, I doubt there will be any characters that absolutely no one recognizes. All that being said, don’t worry too much about cross-checking this list with your selections before PM’ing me; just have fun with it and choose whichever characters you want! 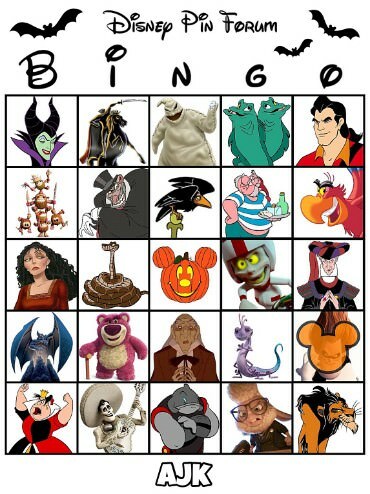 If you pick one that’s from a film not on the list, I’ll let you know and you can swap that character out for another. However, I do recommend that you browse the list to get ideas for characters you might not otherwise think of! Additionally, although they’re not in any of the films below (except maybe Roger Rabbit, and of course A Goofy Movie), I felt that no Disney character list would be complete without these classic icons: Mickey, Minnie, Donald, Daisy, Goofy, Pluto, Chip, and Dale. So feel free to choose any of those characters as well, unless they have already been drawn. Once you’ve officially secured a spot in a new round, your name will be added to the Current Players list below. 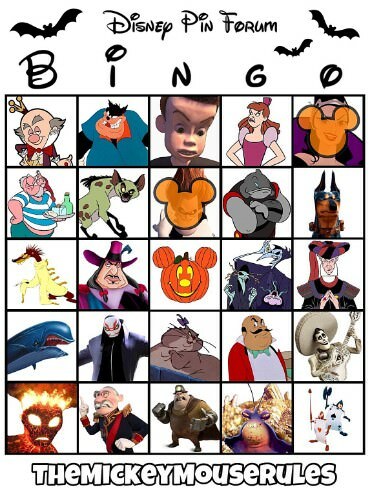 I will then PM you with instructions for submitting your Bingo Card characters. If I do not receive your characters by the deadline stated in my PM, your spot will be forfeited. If you sign up for a new round after all 20 spots have already been claimed, you will automatically be added to the Wait List below. Those on the Wait List will have an early opportunity to claim a spot in the next round. You may also request to join the Wait List at any time while a round is being played; simply leave a comment and I will add you. You cannot join the Wait List if you are currently playing, or if the game is in between rounds. coblj003, Wolfcryrain, pretty Omi and 5 others like this. These characters have already been drawn, and are therefore removed from the game. I’d like to play! 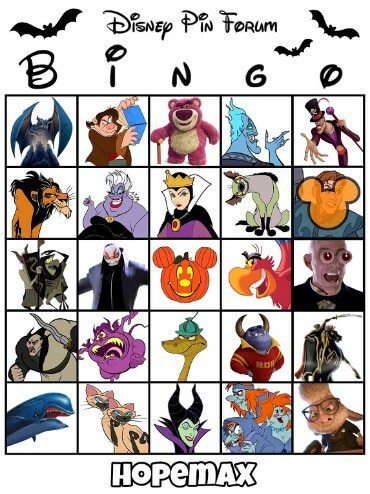 I love Bingo. I would love to play too. 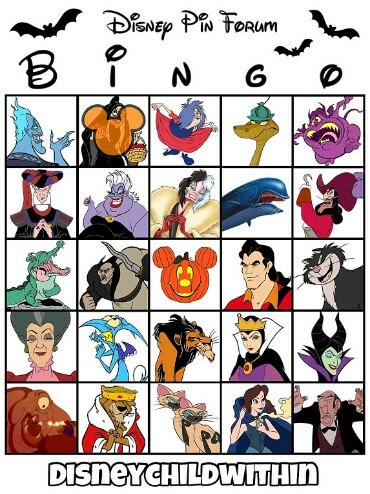 Yay, I love BINGO! Count me in! TheMickeyMouseRules and bcol like this. I'd love to play. Count me in. This sounds like fun! I'd like to play. Fun! I think you're full, but I will happily join the wait list.